We removed OpenFeint as they are shutting down their servers on December 14th after being purchased by GREE. Thanks for playing Smooth Solitaire!!! 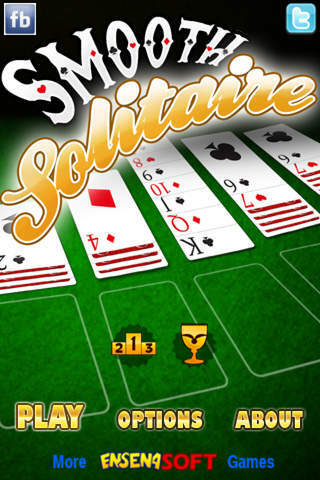 If you like Solitaire then this is the game for you! Both Klondike 1 and Klondike 3 are included and you can move by tap and drag, tap and then tap or double tap to move up to top. Our natural movement system lets you play the way you like. Now with multiple backgrounds and card backs including special Christmas theme! Taking a standard 52-card deck of playing cards (without Jokers), one upturned card is dealt on the left of the playing area, then six downturned cards (from left to right). On top of the downturned cards, an upturned card is dealt on the left-most downturned pile, and downturned cards on the rest until all piles have an upturned card. The four foundations (light rectangles in the upper right corner of game) are built up by suit from Ace (low in this game) to King, and the table piles can be built down by alternate colors, and partial or complete piles can be moved if they are built down by alternate colors also. Any empty piles can be filled with a King or a pile of cards with a King at the top. Completely fill the foundations up to win the game. - Klondike 1 and Klondike 3 modes. This controls how many cards are turned up into the waste at a time. - Supports both portrait and landscape mode while playing! - 3 backgrounds and several cardbacks to choose from. - Christmas theme as well with Christmas music. - Saves your game when you exit or answer a call. Thanks for buying Smooth Solitaire!